"We need you to go to gate 28. It's boarding right now." I grabbed my bags and hustled through security. Just as I was putting my heels back on, scheduling called me back. "Okay, you won't be legal to fly that trip. We need you to go board the flight anyway and we'll send another flight attendant to take your place." (The trip was flying to Vegas and back on a turn. It was too many hours in a duty day for me to work - hence the issue of legality). I basically stood on the plane and greeted about five passengers before my replacement showed up. Grabbing my bags (again), I headed back to the lounge to sit back down. My phone rang again. Scheduling. "Okay, no need to go back down to the lounge. We need you to go to gate 12 now." It makes me so nervous - I don't work international flights very often. I step on to the plane with a surge of adrenaline and contemplate running away because I don't like being a nuisance to people. The crew came down on to the plane and every person was kind and welcoming (aaaand thank you, Jesus). I was ready to work hard and I was ready to go. 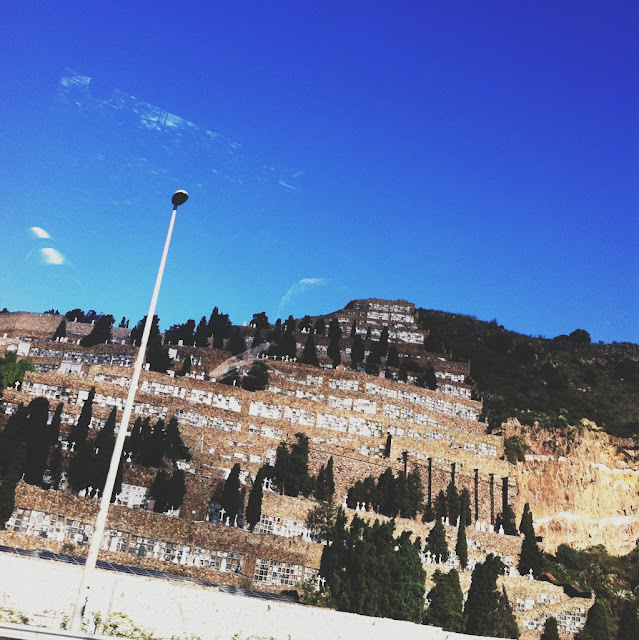 To Spain. After the bustle of our many services and right before my nap, I was standing by the bathroom when a passenger crumpled into a pile on the floor and passed out right next to me. For whatever reason, I always end up being near people when they pass out. Or maybe they see me and pass out. Maybe I'm really Elvis. Whatever the case, we found out they were fine, but had taken an ambien. Guys, don't take ambien. ESPECIALLY ON A PLANE. Why don't you just drink some Sleepytime Extra? I trust a kind-looking bear (wearing a night cap) in a rocking chair sipping tea more than I do an unpredictable drug that causes people to drive while they are asleep. 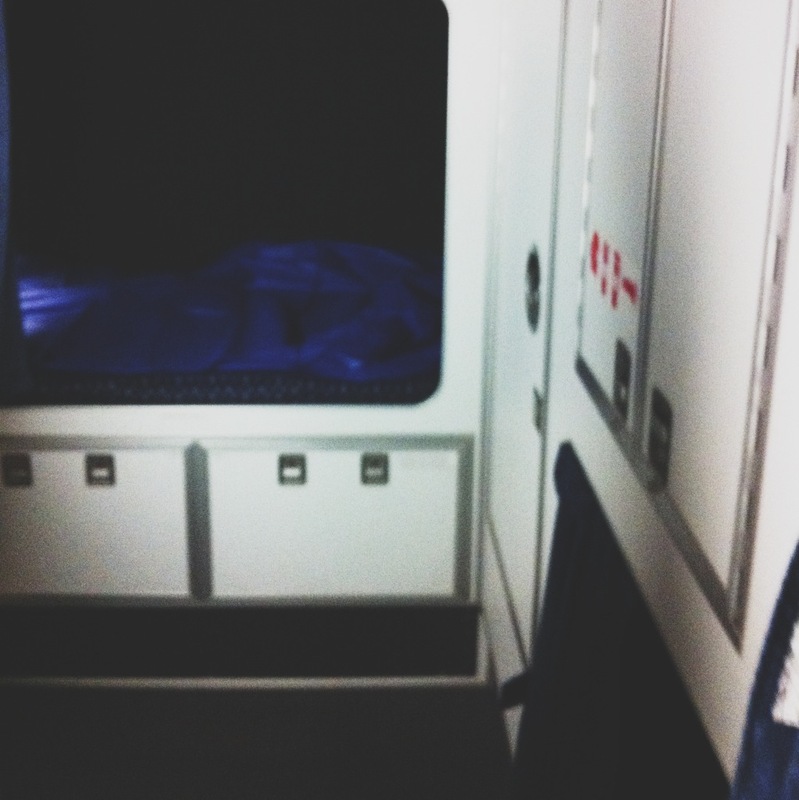 Anyway, I tried to take a nap in our tiny bunks beneath the plane - but I just laid there for an hour and thought about how I wanted to sleep but the air was too dry and I couldn't fall asleep in my uniform. It's a cemetery! While that might not be the most compelling photo you've ever seen from a moving car, don't worry - I took absolutely no other photos. On international flights we've worked through the night and everyone usually takes a two hour nap before going out and sight seeing, or eating or the like. My room had one of those electronic ceiling to floor window shades (like when Kate Winslet goes to sleep in Cameron Diaz' room in The Holiday). I set the timer on my phone for my nap (since my phone was in airplane mode, I couldn't use my alarm). I NEVER PRESSED START ON THE ALARM. I SLEPT FOR HOURS AND HOURS AND I WOKE UP LATE AT NIGHT. I STAYED IN THE HOTEL THE WHOLE TIME. I FAILED, I FAILED BARCELONA AND I'M SORRY. It was a rookie mistake. If you're at all interested in what Barcelona is like - I am thankful to report that the first time I went, I was able to hit the ground running and do just a little bit of everything. CHECK IT OUT. Hahaha - it's not as claustrophobic as you would think! It's like summer camp in the air, Kate! I think that's what I have to tell myself anyway. sometimes you just need to sleep!!! THERE ARE TINY BEDS UNDERNEATH THE PLANE FOR YOU GUYS??? It's like the whole world has just been revealed to me. This changes everything. oh, how sad! hopefully you will fly there again soon. Hotel a Barcellona has a facility and also a great hotel rooms that I browse here. Now I wonder on how to enjoy on that place this coming summer. I want to go to enjoy in Italy because that was my dream. hahaha, this is so funny. i love it. ALSO, there are bunks under the plane?! ?